Adventure Medical Kits’ S.O.L. Survival Pak “gathers all of the critical survival items necessary [for wilderness survival] and packages them in an ultralight, waterproof dry bag.” That’s according to the company press release. In reality, the kit includes a mirror; a whistle; matches; tinder; a space blanket; bilingual survival and first aid instructions; a fishing kit; duct tape; and a compass. Like the company’s original Pocket Survival Pak (which I review here: http://thegearjunkie.com/gear-review-adventure-medical-kits-survival-pak), the upgraded S.O.L. 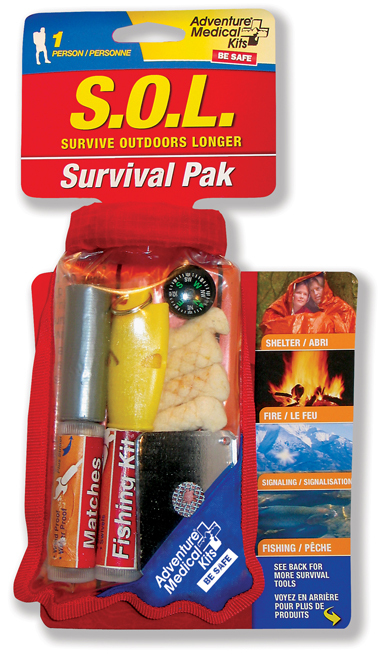 Survival Pak has items that can be employed to signal helicopters and prop planes, start fires, boil water, melt snow, catch fish, navigate through the woods, repair damaged gear, and even save your sanity while awaiting rescue. Upgrades from the Pocket Survival Pak include a roll-top waterproof bag with a clip buckle, plus it comes with a Heatsheets Survival blanket that doubles as a tarp in times of foul weather and wilderness distress. The kit weighs just 4.6 oz.